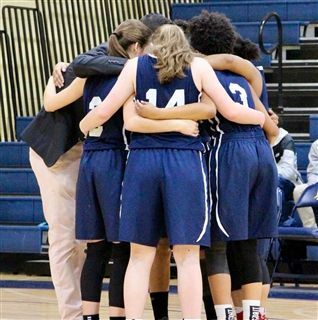 For the first time in program history, the Falcons earned themselves a spot in the final four of the NCISAA 2A State Tournament last weekend. Coming in as the #2 seed with a record of 23-3, the Falcons looked to continue their historic State Tournament run. Friday night’s semi-final saw the Falcons match up against the #6 seeded Spartans of Gaston Day School. In a back and forth opening half, both teams used their defense to create turnovers. The scoreboard read an even 23-23 at the half. The second half saw the Falcons take control of the game through their pressure defense, creating transition opportunities and speeding up the pace of the game. Aaliyah Balser led the Falcon attack, scoring 6 of her team high 13 points in the 3rd quarter. The Falcons finished off the game with an impressive 15-4 run in the fourth quarter to put the game out of hand. In the end, the Falcons advanced to the State Championship game with a final of 54-41 against Gaston Day. “The game had it’s back and forth moments for a while. Once we settled in though, we were able to use our defensive pressure to get stops and find easy scoring opportunities,” reflected Coach Brase after the game. A quick turn around on final four weekend saw Saturday’s NCISAA State Championship Game match-up #2 seeded O’Neal against #1 seeded Davidson Day. This was the third meeting of the season, with the first happening in the championship game of the CRAZE Holiday Invitational and the second at Davidson Day on their homecoming night. Both games were close contests with Davidson Day winning both. Thus the stage was set for the 2A State Championship and a final chapter in the season’s match-up between the two teams. The opening minutes of the game saw both teams looking to find easy buckets to settle the nerves of the big game. The Falcons used their diamond pressure, a staple of their up-tempo style, to capitalize on transition buckets. In a physical game, the foul totals began to build seeing players on both teams watch the first half from the bench. At the half, the score sat tied at 24-24. 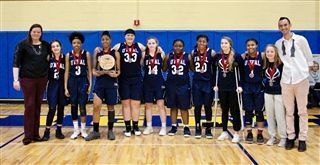 The third quarter turned the tide of the game as Davidson Day leaned on their shooters and knocked down transition jumpers to pull away bringing the score to 45-29 at the end of the third quarter. In the end, the Falcons fought through the fourth, but couldn’t close the gap dropping the game 45-62. “I couldn’t be prouder of this group. Today they showed true toughness, resilience, and grit. They didn’t let a tough shooting night, foul trouble, or the score board stop them from finishing the game on a strong note. Every day we’ve asked them to give us their best, and just like every day since October 29th, they did today as well. As we told them in the locker room, they have nothing to hang their heads about. This team has brought a lot of people joy in our community, and we, Coach Hunt and I, have loved every moment working with this group!” shared Coach Brase after the game. The Falcons, who have been setting new program highs each year, continued to this season finishing with an overall record of 25-4 and 12-0 in Tri-TAC conference play. The Falcons set new program marks making it to the NCISAA 2A State Championship Game for the first time in program history. 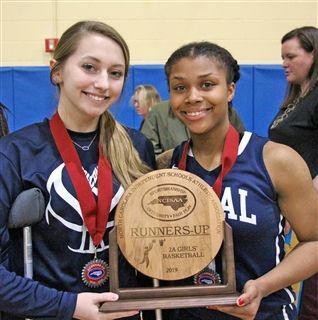 As a team they finished as NCISAA 2A State Runners-Up, Tri-TAC Regular Season Champions and Tri-TAC Tournament Champions.